He speaks, he smiles, he sees, he breathes . . . far from being distant or remote, God reveals himself in images we can understand. Focusing on human metaphors found in Scripture to describe God, Ulmer introduces our heavenly Father as you seldom see him---touchable, emotional, and accessible---leading you into a deeper, more intimate communion with him. 205 pages, softcover from Whitaker. Does this describe you? Has your thirst for more intimate contact with God caused you to reach for anything and everything that will bring you closer to Him? Do you want to know Him as a friend, like Moses did, or capture His heart, like David did? 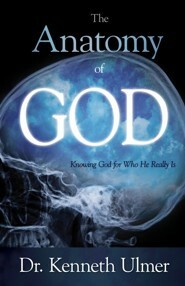 In The Anatomy of God, youll learn that God is not hiding from you. In fact, the Creator of all things desires more than anything to be seen, touched, and known by you! God is a Spirit, yet throughout Scripture, He describes Himself in anatomical terms and images we are familiar with. His eyes wink and squint. His mouth whispers, His smile radiates, and He inclines an attentive ear to our cries. God has hands, arms, and fingers that build, shape, give, protect, and deliver. His heart can be broken, and His nostrils flare when He is angry. His face reveals His glory and His favor. The Anatomy of God is an invitation to see God at work in us, for us, and through us. With appropriate humor and humility, Dr. Kenneth Ulmer introduces us to the Father as we seldom see Himtouchable, emotional, and accessible. Ulmer navigates the seemingly unfathomable depths of the person of God with a pastors care, a teachers skill, and a preachers passion, guiding us into deeper, more meaningful communion. This book is for every man or woman who desires to know God or to know Him better. It is for anyone who questions Gods closeness or doubts His concern. The Anatomy of God brings us closer to God by bringing God closer to us. Dr. Kenneth Ulmer is a widely acclaimed speaker, pastor, and writer who serves as senior pastor at Faithful Central Bible Church in Inglewood, California. Dr. Ulmer received his B.A. in Broadcasting & Music from the University of Illinois. After accepting his call to the ministry, he founded Macedonia Bible Church in San Pedro, California. Dr. Ulmer has studied at Pepperdine University, Hebrew Union College, the University of Judaism, and Christ Church and Wadham College at Oxford University in England. He received his PhD. from Grace Graduate School of Theology in Long Beach, California, was awarded an Honorary Doctor of Divinity from Southern California School of Ministry, and received his Doctor of Ministry from United Theological Seminary. Dr. Ulmer participated in the study of Ecumenical Liturgy and Worship at Magdalene College at Oxford University in England, has served as instructor in Pastoral Ministry and Homiletic at Grace Theological Seminary, as an adjunct professor at Biola University (where he served on the Board of Trustees), and as an adjunct professor at Pepperdine University. He served as a mentor in the Doctor of Ministry degree program at United Theological Seminary in Dayton, Ohio. Dr. Ulmer is currently the Presiding Bishop over Macedonia International Bible Fellowship, based in Johannesburg, South Africa, an association of pastors representing ministries in Africa and the U.S.
Ken Ulmer is one of Americas new voices, rising with a penetrating call to pragmatic spiritual dynamics. As a Christian leader, he stands tall; as a servant to society, he stands out; as a friend, he stands trustworthy; as a man of God, he stands closein touch with our Father, that he might be in touch with Him whose touch can change the world. to love God more deeply and to worship Him more fully! have no doubt never considered. I'm the author/artist and I want to review Anatomy Of God.